Blockchain technology has come a long way since the release of Bitcoins in 2008. Similar digital currencies have crept into the worldwide market, creating more mining business. While mining isn’t a crime, few websites have made it look like one. Have you experienced sudden rise in CPU/RAM usage by you browser, as soon as you website some website? If the issues sustains for all the websites, there could be a problem with your browser but if it gets triggered only on some sites, it’s probably browser mining. Not just browsers, Mobile Apps are also involved in incorporating cryptocurrency mining code. The benefits of Cryptocurrency Mining is, no Ads on websites or Apps. The user enjoy a clean interface but provides a small or major share of their CPU usage until the time they stay on the website. Before starting of ways to prevent this, let’s discuss what exactly is Cryptocurrency Mining and how it’s implemented to use your device without your permission. Do you have the bitcoin that you want to send? Have you used or sent the same bitcoin in the past? Once the above points are verified, your transaction gets included in a “block” which gets attached to the previous block – hence the term “blockchain.” Transactions can’t be undone or tampered with, because it would mean re-doing all the blocks that came after. So where is the mining involved in this? Mining refers to processing cryptocurrency transactions. Miners get rewarded whenever they process a transaction and solve for a new block. The rewards aren’t big, just a fraction of the transaction value. But many transactions happen in a day, a fraction would turn into some dollars. The mining process involves solving mathematical problems. These problems get difficult with time. 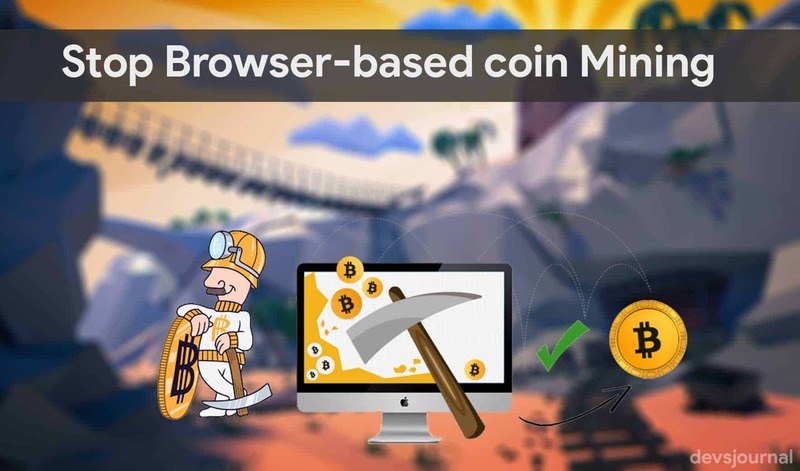 As the difficulty increases the miner would need fast and reliable technology. Cyrptocurrency mining does come for a hefty cost. The cost of electricity and hardwares are a bomb. If you could invest atleast $3000-$5000 in up-front hardware costs, at which time you could potentially earn $50 per day or more. What if you get the hardware for free? Yes, that’s where Browser-Based Cryptocurrency Mining comes into the show. This is different compared to the more widely known file-based cryptocurrency mining approach which involves downloading and running a dedicated executable file. 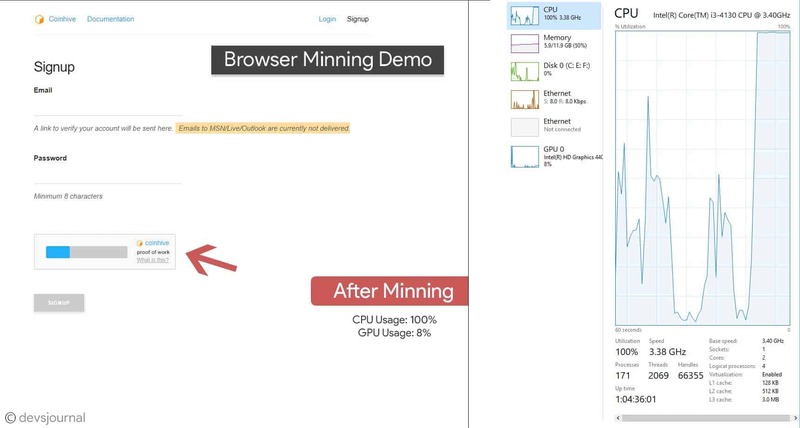 Browser-Based Cryptocurrency Mining is not new; it’s been around since at least 2011. While everyone thought it was dead, in the late 2017 it all started with the launch of a new browser-based mining service in September by Coinhive. This service provides an easy-to-use package for website owners which makes it easy to implement & earning source. It’s just been few months since Browser mining became popular. While most of the browsers remain unaware of the background process, there are few browsers that come with in-built feature to prevent such scripts to execute in background. One of such browser is Brave browser! It’s an open-source project which provide faster browsing experience by disabling tracking scripts that keep on hogging your Internet and CPU. This is a manual way to prevent minings from your device. In this, we’ll block the websites from which the scripts are being executed. 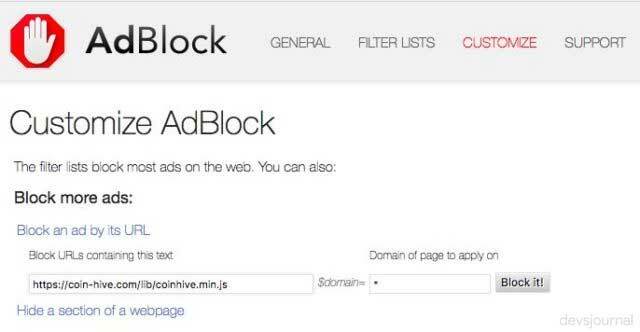 For example, Coinhive scripts are executed from “coin-hive.com” so we’ll block it. This works best if the script source if known to you. Add below lines at the end of the hosts file. If you find any other website, you can add it below the list with a prefix 0.0.0.0 which disables your PC to connect with that server. Malicious cryptocurrency mining isn’t just confined to desktop computers and servers. Always-connected mobile devices are also a growing target. According to Symantec’s report, there’s around 34 percent increase in mobile Apps with mining codes. This metrics are acceptable as Mobile processors have evolved to be as powerful as low- to mid-range desktop computers. Considering the current cryptocurrency market where many people are still unaware of different cryptocurrencies, there are chances that such unethical activity would increase by time. Along with the users, Website owners should watch for injection of the browser-mining scripts into their website source code. How to find and fix Malware infected Android phone?